The EPCC NEWS sources learned today that the general elections under the reactionary Government of the Republic of the Philippines has kicked off with the usual circus that holds sway among the populace and feeds on their decades-old aspiration for true change in Philippine society. The National Democratic Front-Southern Mindanao states its position on the reactionary GRP elections: That the Filipino masses should bear no illusion that the elections will bring about thoroughgoing change in our semi-feudal and semi-colonial society, and that only the People's Democratic Revolution is our way to genuine liberation and national development. 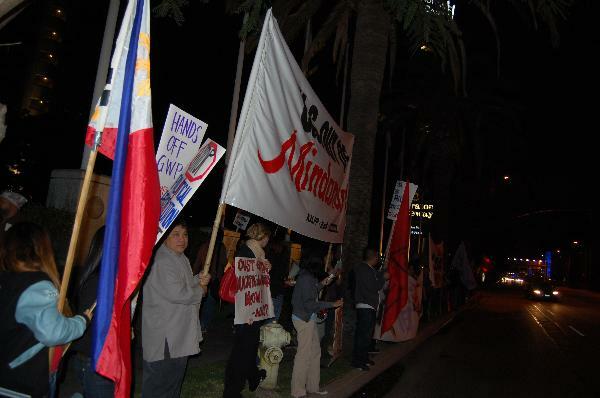 Los Angeles- The EPCC NEWS sources learned today that the general elections under the reactionary Government of the Republic of the Philippines has kicked off with the usual circus that holds sway among the populace and feeds on their decades-old aspiration for true change in Philippine society. The National Democratic Front-Southern Mindanao states its position on the reactionary GRP elections: That the Filipino masses should bear no illusion that the elections will bring about thoroughgoing change in our semi-feudal and semi-colonial society, and that only the People's Democratic Revolution is our way to genuine liberation and national development. As the local ruling classes -- the bureaucrat capitalists, bourgeois compradors, and big landlords -- composing only about one percent of the current Philippine population of 93.9 million -- continue to dominate majority of the country's resources; and the ruling class deliberately dries the country's coffers for their vested self-interests, meaningful changes can never be achieved. As it is, the rottenness and chronic crisis of semi-colonialism and semi-feudalism is the root of widespread poverty and the nation's underdevelopment. With the GRP elections, the Filipino people once more attempts to contemplate on their future and wants to extricate themselves from exploitation and injustice that has enslaved them throughout centuries. Majority of the Filipinos wallow in utter destitution with 65.89 million belonging to the poorest of the poor by the end of 2006 alone. In 2009, 3,891 Filipinos go out of the country everyday, taking the financial and security risks of leaving their families behind and the country in a serious brain drain. Hundreds of thousands are now scratching the bottom and trying to rise above their situation after becoming victims, if not survivors, of the series of natural disasters like typhoons Ondoy and Reming; and man-made calamities like landslides due to large-scale mining, widespread reckless logging, and displacements due to militarization. As of 2002, only 33.33% of the 4.8 million registered landowners own 80% of agricultural lands. Seventy percent of peasants do not own the land they till. As of January 2010, the daily minimum wage nationwide ranges from PhP 178 to PhP 382, while the average cost of living per day for a family of six (as of September 2008) is PhP 842.40. In 2009, out of an estimated labor force of 38.196 million, 2.71 million (7.1%) are unemployed, 35.484 million are employed with 6.88 million (19.4%) verifiably employed in the formal sector and 28.6 million (80.6%) supposedly in the informal sector (services and agriculture) most of whom are underemployed. The country's current political and economic situation calls for a need of sweeping and thoroughgoing structural changes that favor the masses. Only a real people's revolution which advances genuine education for the youth and students, accessible social services for the people, genuine land reform for the peasants, just wages and humane working conditions for the workers, and protection of our natural patrimony, among others, can guarantee the attainment of these people's demands. The country's foreign debt is now at its highest with $5.17 billion. Worse, the GRP has prioritized paying for debt interests by allocating more than 50 percent of the annual GRP budget through the automatic appropriations law for debt servicing. As of 2009, the budget allocated for the Department of National Defense is higher than what was allocated for State Colleges and Universities. The total budget for AFP modernization is greater compared to allocations for the Department of Agriculture. This alone shows that the GRP, currently represented by the Arroyo regime, does not prioritize the masses but favors its master, US imperialism. Successive regimes have come and gone with various leaders promising the moon and trumpeting the country's advance to development. Yet, through many years of GRP reactionary elections, the people's woes have dramatically worsened showing the superficiality of elections as the anti-dote to widespread poverty and national underdevelopment. Come GRP elections, various candidates and parties will highlight their platforms and would use a humungous amount of money -- including sheer might, threat, and intimidation -- to ensure victory. AFP generals will jockey up for their patrons, if not run for public office themselves, and use the military bureaucracy to their advantage. Reactionary politicians and their AFP/PNP cohorts are employing fascism to contain the influence of progressive candidates and partylists, and resort to liquidation of supporters and progressive leaders. But unless held under a genuine democratic social order, elections will remain to be an exclusive political arena controlled by and serving the political and economic interests of the local ruling elite and their foreign masters. In the Philippines, elections held under the auspices of the GRP are a mere expression of the power struggle among acrimonious factions of the elite. They neither resolve the issues nor cater to the interests of the majority. But while there can be no fundamental pro-people political, economic, and social changes that the people can expect from the traditional electoral exercises of the GRP, the revolutionary movement recognizes the important role of a progressive mass movement that engages in parliamentary struggle and electoral struggle as one of its forms in bringing to the fore the basic issues and the need for meaningful structural reforms. It recognizes candidates and parties who push for the rights and interests of the workers, peasants, youth and students, women, the Moro, and Lumad, among others. The people must note that the Arroyo regime will maneuver to advance Mrs. Gloria Macapagal Arroyo's political agenda of perpetuating herself in power. It would use all available means possible for Mrs. Arroyo and her minions to dominate the GRP Congress and catapult herself into the prime ministership under a parliamentary form of government. As of the moment, the US-Arroyo regime's game planners will maximize the vulnerability of the automated elections while pushing Constitutional change either through Constitutional Assembly or Constitutional Convention. The US-Arroyo regime's most loyal lackey in Congress, Prospero Nograles, has been persistent in pushing Charter Change while abandoning important issues of the people who he shamelessly claims to serve. The NDF in Southern Mindanao urges the workers, peasants, and middle forces to raise the basic issues of economic exploitation, national sovereignty and patrimony and human rights, among others so that their participation in the electoral struggle will be meaningful. It likewise urges the people to support parties and candidates that truly promote the issues and interests of the people. Now more than ever, is the time to be vigilant and militant in thwarting Gloria Arroyo's maneuvers and defeat the anti-people campaign of Arroyo's rabid hound dogs like ANAD and Bantay, and candidates who have a long track record of counterrevolution like General Jovito Palparan.